I am quite annoyed and sad because I’ve lost the draft of my review of St-Emilion. I don’t know what’s happened. Yesterday I had finished writing and save it before I went out to meet an expert in oenology and food science. That is just life…maybe my blog got hacked by a pro-St-Emilion because my blog was full of disappointment and disgust at times toward the St-Emilion’s money business and bad wines. I used to use another program for drafting but I stopped it recently and this thing happened. Anyway…let’s not look back and move on. Recently I’ve been having a lot of discussions with people on various subjects such as sulfites in wine, wine headaches, whole berry fermentation, oak barrels, price vs quality, wine export business, etc. I’d met so many people who talk about sulfites and hangover, which I never believed there was any connections because I’ve never had hangovers from eating dried apricots, which contains more sulfites than wine. So I always ask the same question to the people who blame wine for sulfites. But this time I decided to do deeper investigation for a technical and scientific explanation and found a page that might clear the myths and misunderstanding about the relation between sulfites and headaches. To tell the result first, sulfites are NOT responsible for the hangovers or headaches you’ve suffered from drinking wine, especially red wine. It is, in fact, to do with tannins and serotonin, histamine, dehydration, lack of Vitamin B6&B12, etc. Especailly, the facts about serotonin was the most interesting. That’s why wine is to be drunk with food, especially some Bordeaux wines that are more tannic than other international wines. If you have other explanations, please share with me and other people who suffer from red wine headaches. Additionally, I asked the oenologist about the issue last night and he also confirmed that sulfites were innocent. We also had a very intriguing conversation about biodynamic, organic farming and winemaking, and sustainable eating, etc. so the evening went on till the early morning. 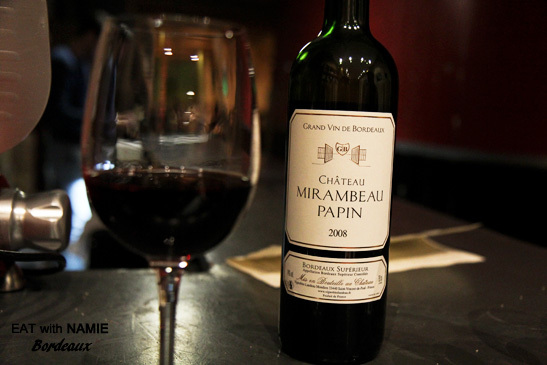 What kept our conversation going for 4.5 hours was Château Mirambeau–Papin 2008 and the nice ambience at L’oenolimit. I’ve been going to this cave and wine bar for a while now ever since I first visited 2 years ago. I love everything about the place, the warm trendy rustic interior, barrel tables, comfy couch, lively and relaxing atmosphere, friendly smiley staff, who sincerely talk with you about the wines and give advice, nice simple snacks to accompany wines till the very closing hour, which is very conveniently late, 1.30 -2.00am! The best and the most important point, it being a wine cellar, is that their wine collection is the best in town. 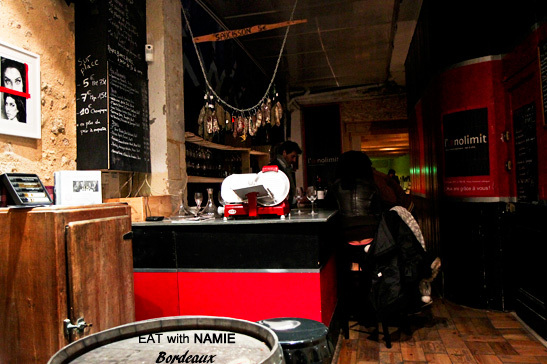 I’ve never had any bad wines there as I have in many other wine bars such as Le Bô bar. Don’t ever go there. They operate with an interesting theme of blinding tasting where you don’t pick wine but are served one by the owner and you have to guess what it is. Well…I tried it just for fun and had the worst wine in my life and wanted my money back. I didn’t even finish the glass and left to go to Le Wine Bar, which became another favourite place for wine and cheese. It’s an Italian wine bar and the owner is really lovely and generous. Besides Italian wines, he also stocks up rare inexpensive wine of superior quality such as Syrian wine, which I’m yet to taste because the stock was out when I was there. I won’t forget Château Mirambeau–Papin 2008 for life not only because it was a good wine but also I think I had the wine in the good company. Whether the wine tasted good because it was drunk with someone who is like-minded and appreciates wine or the conversation flourished because the wine was good, I will remember it for long. It was really beautiful and delicious on the nose, almost perfect, and when I drank it, it was rush and smooth but went down leaving a hole in the mid palate and a bit too much weight on the sides of the tongue, a bit acidic, as if the wine wasn’t fully opened up. So we let the wine breathe while chatting and sipping little by little, and at one point, the mid palate was fulfilled magically! After that, the wine showed off its charms to the full and it was absolutely pleasant. “It was a joilie good drop” we both agreed and that is why we need to drink SLOWLY. I love checking how the taste of wine changes over time after opening so I tend to drink slowly at the beginning. And discovering that he was also a big fan of Petit Verdot gave me a big smile and I asked him if he could say that the wine had Petit Verdot in it. I’m not sure and I don’t care anymore of the blending as it was nice and had the floral aroma and the taste of blackforest cake, which used to be my favourite dessert – now it’s Fondant au Chocolat. If you haven’t tried a wine made with 100% Petit Verdot, you should try Papin Le Petit Verdot 2009, which I will try next time I go there to compare with the Australian Petit Verdot I had a long time ago. My philosophy is also that good wines doesn’t mean expensive wine, especially in Bordeaux, however, when I meet bad wine lists at restaurants, I wonder why people don’t bother to find good wines at reasonable price. The place I’ve had the best wine is Bordeaux, and it is also the place where I have had the worst wine in my life. 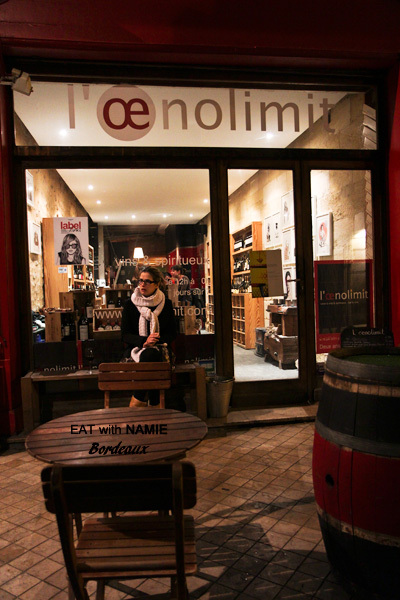 Luckily, there is a place like L’oenolimit that is doing an honest job for wine lovers and I love it! The oenologiest and I are going to Salon de Vignorons Independents tomorrow. So more interesting talks are expected in the next days and weeks to come. So…my dilema is now whether to trace my memory to rewrite the lost post or forget it. Grrr….. This is an interesting point about tannins – I know many people who complain about headache associated with drinking of the red wines, but I never thought of tannins as a culprit. At the same time, I’m not sure if those people were drinking the wine with or without the food – but this is definitely something to keep in mind.